In case you've been asleep for the last month, we recently announced the industry's most comprehensive analysis (by far) of RPA product functionality, covering AntWorks, Automation Anywhere, BluePrism, Kofax, Kryon, NICE, Pega, Thoughtonomy, UiPath, and Workfusion. RPA’s core functionality works but deployments are not as easy as promised. RPA products offer adequate client support and training but IT skills are required. 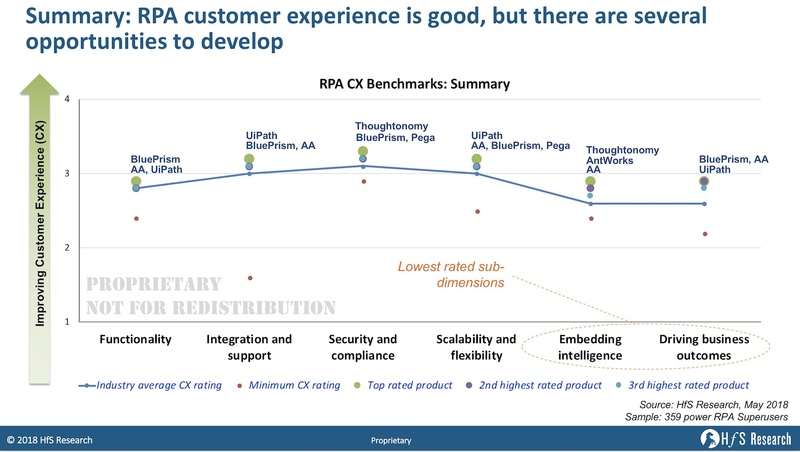 Some RPA products have made significantly more investments than others around client support. Most RPA products performed well on security and compliance related assessment. RPA products have shown satisfactory flexibility but clients are still confused about pricing models. RPA products are not as intelligent as they claim to be (at least not yet!). RPA satisfaction is middling. Clients have largely realized cost savings, but speed-to-market has not met expectations.